I’m sure that a lot of music is designed from the point of view of the listener, concentrating on what the listener wants, putting them at the centre and delivering a reassuring experience. 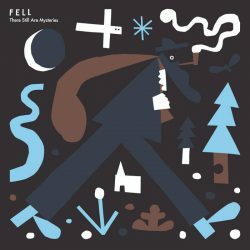 I’m equally as sure that Nicolas Burrows doesn’t work that way, as Glaciers and now as FELL he makes music very much from his own point of view. This is considerably higher-fi than previous recordings – the songs are full of gently modulated atmospheres, though not sounding like, I’m often reminded of the American Analog Set. ‘Other Ways’ with its falsetto vocal and heat haze guitars puts me in mind of the slo-core Radar Brothers. The reference points aren’t overt as Burrows is too canny for that – influences are internalised and synthesised, the instrumentation working in pretty much the same way, guitars and keyboards bleeding into each other and even the squeals of saxophone on ‘Islands Fold’ are further distorted. ‘Song of the Green Man’ drifts close to the later work of Mark Hollis and Talk Talk, where the synthetic and organic elements sit together, like a musical Westworld. ‘Let Me Go On’ shows him at his warmest, the music having a late evening slanted sunlight on the water feel, with the organ a summery undertone. There are more drowsy summery sounds on ‘Sleepy Old Snake’ which relies on acoustic guitars and electric piano to build the atmosphere. When the electric guitars slide in, they don’t break the spell, they just heighten it. ‘You Are All I Need’ does something similar where the acoustic guitar sets the scene and the curtains are thrown back letting in the electric light of the guitar. These songs are understated delights.